It's been a year since my last post... this is a gap too long. I've still been taking bridge pics, just -- not posting, for some reason. I dunno. New bridges mean driving further and further... still worth doing, but now they require a bit of planning to get to. Spring has finally come to New England after a horribly long winter. I've been wanting to hunt the bridges that cross the Cape Cod Canal for a long time, but it's always been either too cold, or too filled with tourists. These bridges are a huge bottleneck for people traveling to and from the cape. 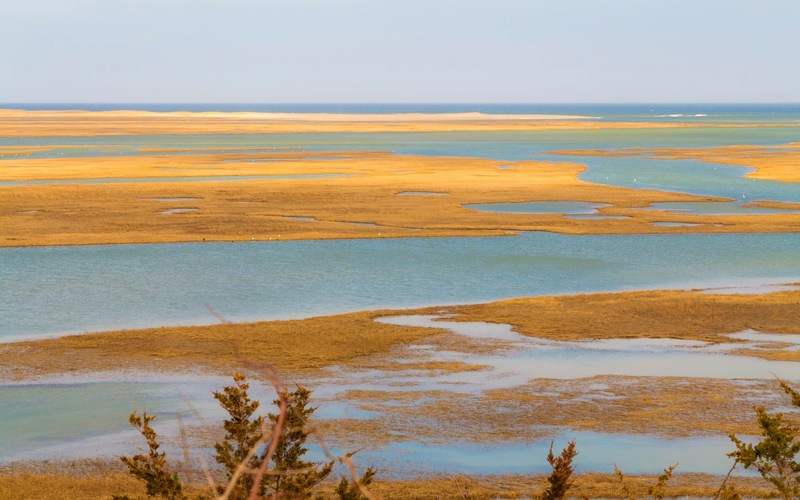 The roads from Bourne to Provincetown are narrow and slow. There might be just a couple of weekends left before the antique shops re-open and the cars start to pile up. This was my chance to get these bridges before it was too late for another year. 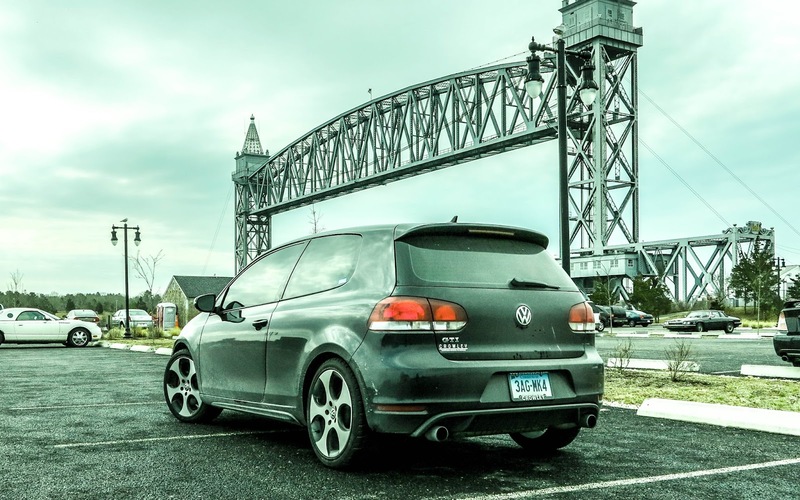 Buzzards Bay Railroad Bridge, and OMG MY CAR!!! 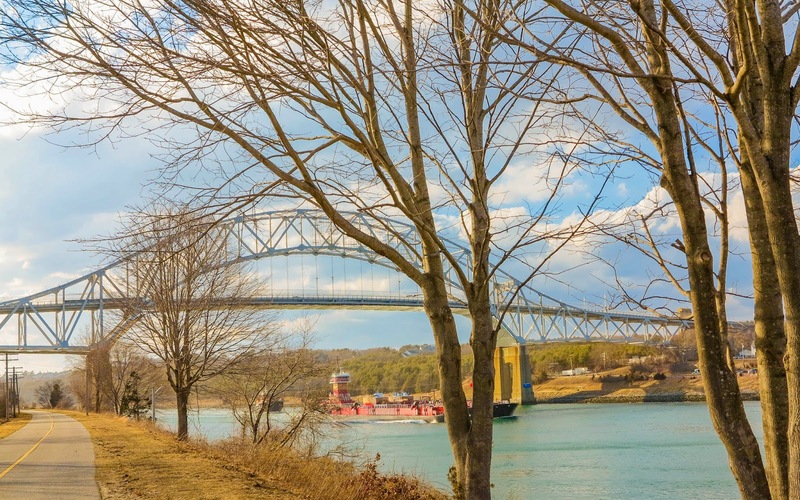 The Cape Cod Canal is a seven mile canal formed by connecting and widening two rivers that allow shipping to and from further down the East coast to get to Boston-area ports without having to round the cape. 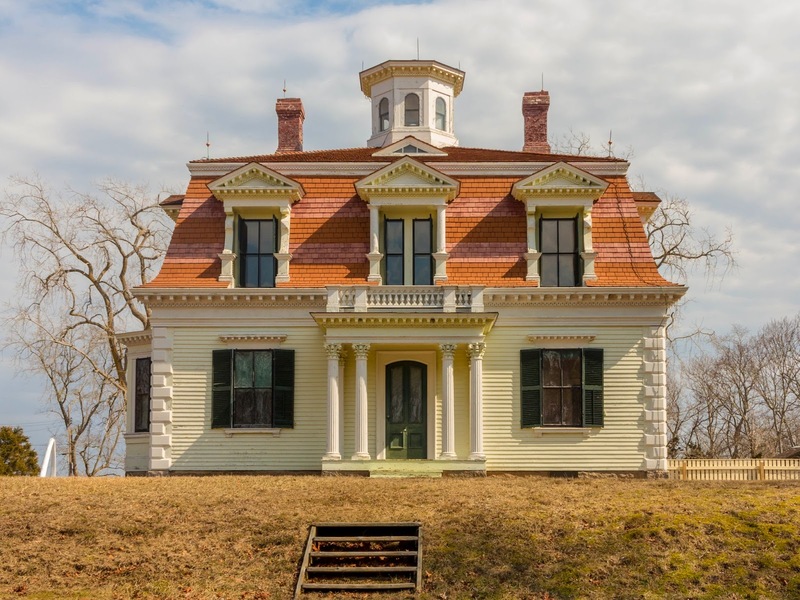 The Wikipedia mentions that George Washington once surveyed a potential path for the canal... building on work the Pilgrims had begun a hundred years earlier. This canal, though, is only about a hundred years old. 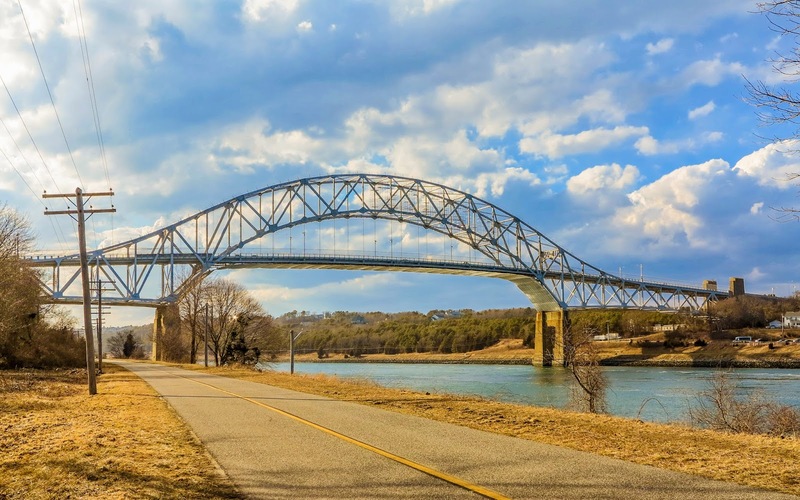 The Sagamore Bridge on the north end of the canal, and the Bourne Bridge near the southern end, are both steel arch bridges with suspended roadways. They carry a substantial number of cars each day, but during summer, the lines of cars waiting to cross can reach miles long. 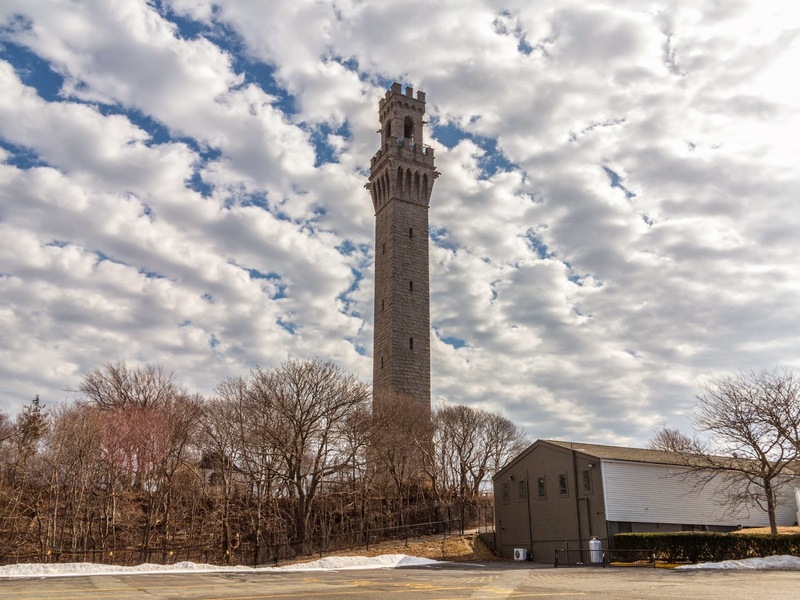 This is why many residents opt to use the Cape Cod Canal Tunnel to skip the crowds. It was pretty cloudy when I got to the cape, so I apologize for the dullness of the Bourne and railroad bridge pictures. When I got to the Sagamore Bridge on the way home from Provincetown, the day was much nicer. I probably should have gone back to Buzzards Bay and re-taken those bridge shots, but -- it had been a long day. 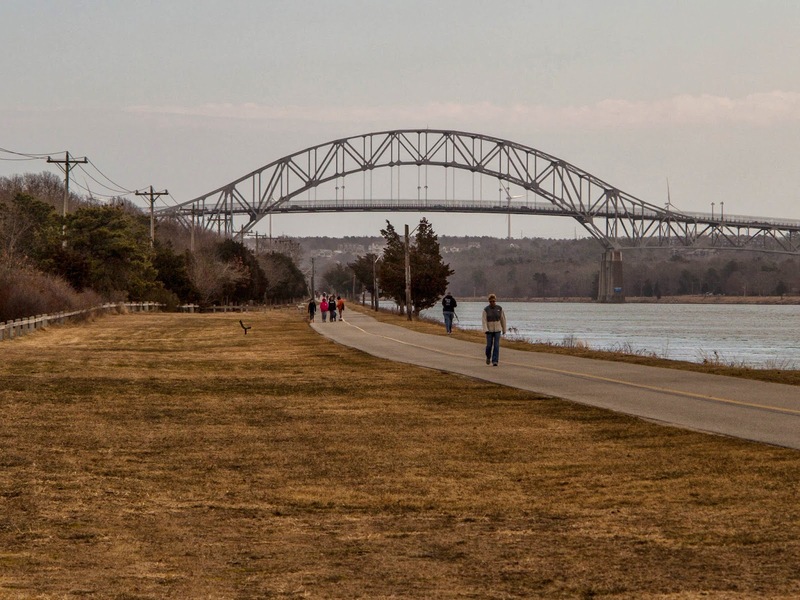 Long, paved trails stretch along both sides of the Cape Cod Canal, and both sides were crowded with people out for a walk, a bike ride, or roller blading. I really should have brought my bike. Behind the Bourne Bridge in the picture just above are a few wind turbines. The constant winds through the hills surrounding the canal turn the turbines and help power the Massachusetts Military Reservation. 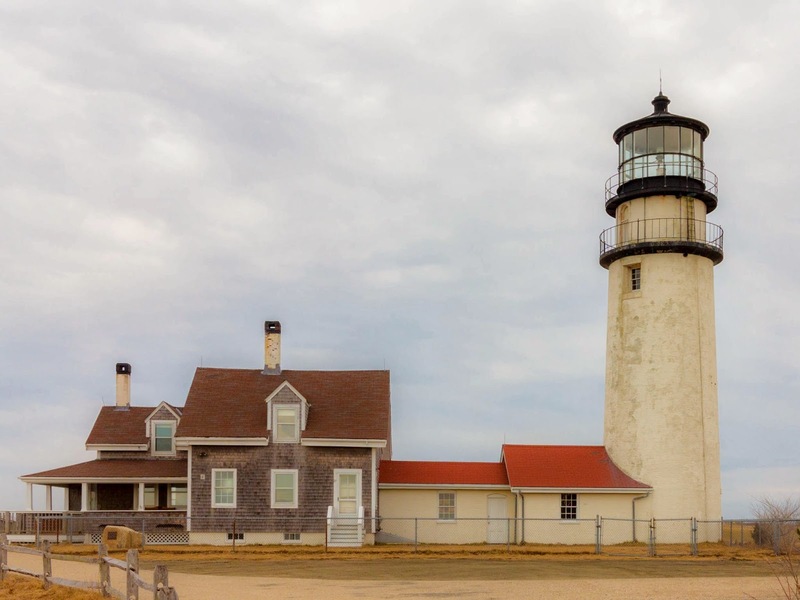 Cape Cod will also soon host the Cape Wind project, an offshore wind farm that has just last week cleared its last legal hurdle. Detractors claim the sight of turbines turning lazily on the horizon will kill the tourist trade (and unwary seabirds), but.... I have loved wind farms since I first saw the ones in Pacheco Pass and Altamont Pass back in California. Here's a better picture of the Buzzards Bay Railroad Bridge, AKA the Cape Cod Canal Railroad Bridge, without my car in it. 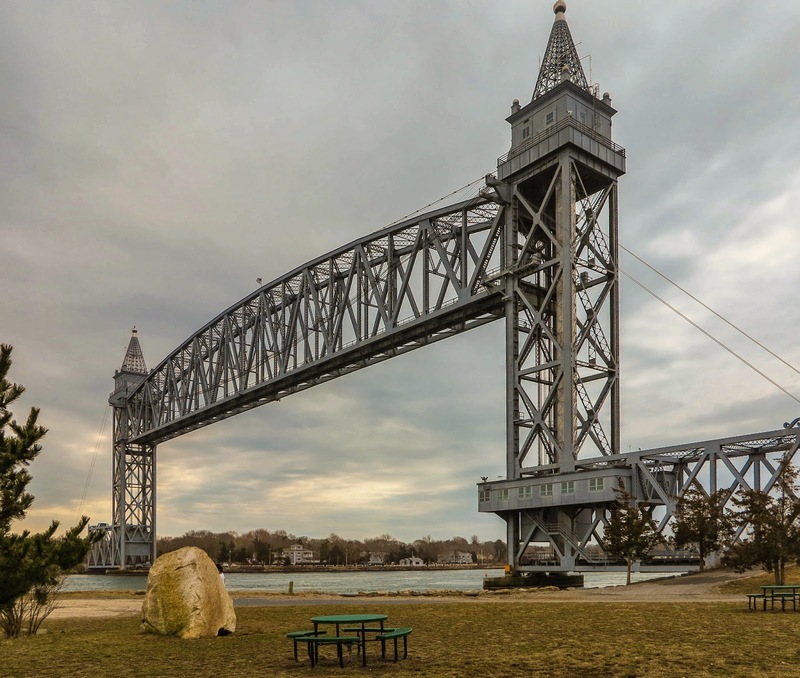 This bridge, the southernmost bridge over the Cape Cod Canal, is a lift bridge that services the tourist trade -- a local area tourist train (the Cape Cod Central Railroad) and an express train from the Boston area (the CapeFLYER). Since I went out of season, neither train was running and the bridge stayed up the entire time I was in the area. There's enough traffic in the canal to keep boat watchers happy; while I was photographing the Sagamore Bridge, a tug pushing a barge, followed by another tug, zoomed by. I'm disappointed in myself for taking so long to visit these wonderful bridges. Best thing about them is -- there's an entire cape of wonderful things just pass them. It's not easy to miss these bridges if you're going to Cape Cod; in fact, they're impossible to avoid. All pictures were taken with a Canon G 1X point and shoot camera. I brought my Canon DSL, but I just ended up using the small camera because the pictures were coming out just as nicely. Welcome back! Wonderful pictures. Also a charming, wistful song. Wind farms are so bizarrely controversial. Like you, I've loved them since I saw my firs turbine, so long ago I can't remember exactly where but somewhere in Spain, where they have become an inseparable part of the landscape, like the huge Osborne Sherry hoardings in the shape of black fighting bulls that so terrified me on my trips there as a child in the 1960s. In the 1990s Spain decided to ban all roadside advertizing but there was such an outcry over the loss of these bulls that they were allowed to stay, now painted black all over, because, as Wikipedia has it, they had become "a part of the landscape and have "aesthetic or cultural significance" ". Wind farms are like that - put there by humans for a pragmatic purpose but falling magnificently into the landscape, adding to the natural grandeur rather than detracting from it. When we travel through the Spanish hills and plains we like to picnic beside the turbines, listening to the great, thrumming sounds and watching the intricate dance of the blades. Windmill-haters say "well, you might like them when they're on someone else's land but you wouldn't want one in your back garden, would you?". Well, yes, I would, although it wouldn't be the same without fifty more alongside. Like you, I love being near the wind farms. I used to travel through Pacheco Pass every couple of weeks, and I wanted, each time, to just stop the car, wander through the fields. They had these regular turbines, and also some vertical egg-beater turbines. It just seemed a welcoming place of peace and hope. I know that they are dangerous to birds. I'm probably heading down to the new Q Bridge in New Haven soon to see how the construction is coming along. They have a couple turbines next to the bridge; hoping they have more, now.